From humble beginnings at local farmers’ markets to becoming the largest artisan bakery in Seattle, our commitment to organic, sustainable and socially responsible practices has never wavered. That’s why we’re excited to explain our innovative Bake-at-Home packaging and show how viable its sustainability is. Traditionally, in the grocery store bakery department, bread that goes unbought by the end of the day gets thrown in the garbage –that’s a lot of bread from a lot of different companies! Obviously that doesn’t sit well with us –too much waste! We didn’t want to waste organic flour from our hard-working farmers. We didn’t want to waste energy at the mill and at our bakery. We didn’t want to waste fuel from tractors, and our delivery trucks. The list goes on and on. Extending the shelf life of our organic Bake-at-Home breads to reduce waste and allow people everywhere to have access to fresh-baked bread when they want it is not only new and innovative, but above all – sustainable! The cardboard box is 100% recyclable and adds extra protection from accidental punctures to the package during delivery. It also makes it much easier to merchandise on the shelf so that you can find it in the store! 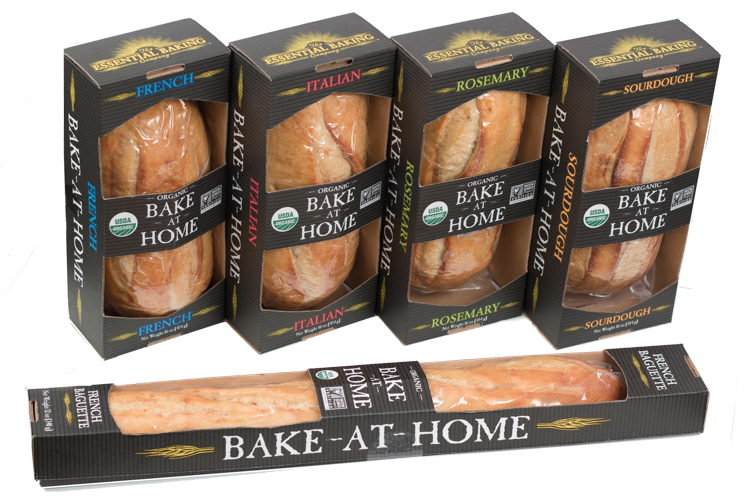 The Bake-at-Home bread line includes 5 new varieties: Sourdough, Rosemary, French, Italian, and French Baguette. We hope you pick one up at your neighborhood grocery store and give it a try! Just bake the bread in your oven at home and enjoy fresh baked bread any time you want it. As always, if you have questions, please don’t hesitate to reach out! Visit our eStore to buy on-line. Also check out our breads baked fresh daily, available in your local grocery store.